The "yes" component to "Is this compatible with my 'cross frame?" 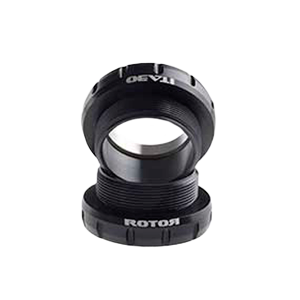 ROTOR´s Universal Bottom Bracket concept was designed to ease the frustration that´s been boiling over as a result of complicated bottom bracket/crank compatibility challenges. The proliferation of so-called bottom bracket standards has spawned a variety of symptoms that the UBB has successfully treated by providing a solution to fit your bike, regardless of BB type.